When my boyfriend and I decided to plan a trip to India over the holidays, I immediately started researching tips to visit the Taj Mahal. I found a lot of information, but wasn’t able to find one place to answer all of the questions I had. For example, what is the ideal time to get in line? Which is the best gate to enter? How do I avoid tourist traps at the entrance? Should I stay in Agra overnight or take a day trip from Delhi? How do I get the perfect picture of the Taj Mahal? In this post, I’ll answer all of those questions & more. 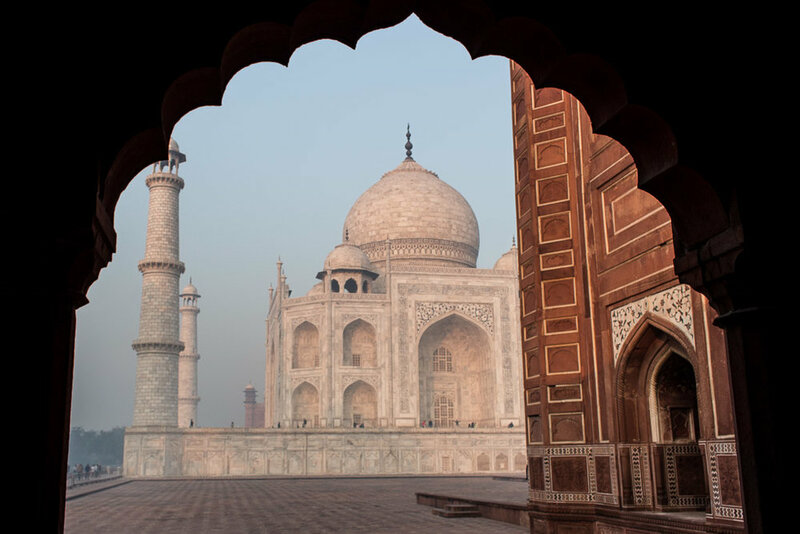 Even after all of my research, I was still a little apprehensive about dealing with the crowds, weeding through fake tour guides, and even being underwhelmed by the Taj Mahal itself. This experience was one of the main reasons I decided to fly across the world to visit India and I wanted it to go perfectly. However, all of that worrying was immediately erased as soon as I entered the main gate. I was one of the first people through the gate and got to watch the sunrise over the majestic palace on Christmas morning. I was even able to share the experience with my mom because I had a portable wifi device! If you have the chance to visit the Taj Mahal, take it. You won’t regret it. The jewels that cover the exterior of the Taj Mahal sparkle in the sunlight. Watching the sunrise from under an arch of the red sandstone wall at the right side of the Taj Mahal. My boyfriend was laying on the ground to get this shot. He's a keeper. We started our India adventure in Delhi, the capital city located in the North, and spent two full days there. On our third day, we drove to Agra, which is where the Taj Mahal is located. We spent that afternoon and one night in Agra and visited the Taj Mahal at sunrise the next day, then drove straight to Jaipur, the pink city. From there, we explored Jodhpur, the blue city, and ventured south to Goa and Kerala. This is my second India blog post, and I’ll have more coming soon! This picture was taken from the platform in front of the reflection pool. The Taj Mahal was commissioned in 1631 by Shah Jahan, the fifth Mughal emperor, as a mausoleum (tomb) for one of his wives. It was completed in 1643 and is a shining example of classic Mughal architecture. 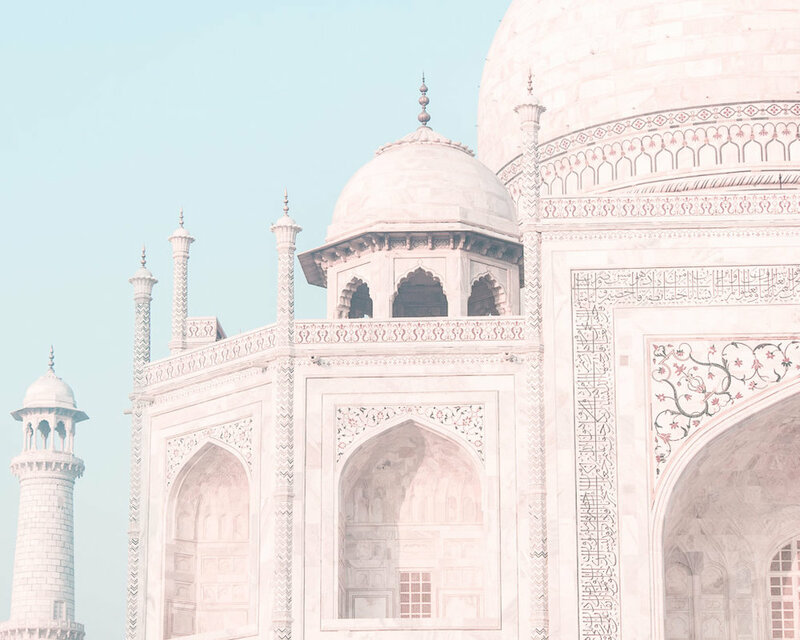 The Taj Mahal has a special place in India's long and complex history, but the purpose of this post is to give you as much practical advice as possible before seeing it in person, so make sure to read up on it before you go! I recommend reading about it on the UNESCO World Heritage website. Sitting in front of the red sandstone wall on the left side of the Taj Mahal. You can visit the Taj Mahal any time of the year, but I recommend visiting in the winter months from November to February to avoid the heat or the summer rainy season. I visited on Christmas morning in December. 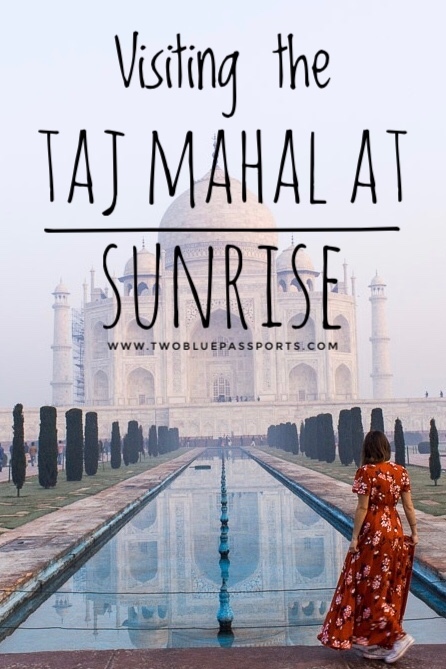 The Taj Mahal is open from sunrise to sunset every day except Friday, but the absolute best time to go is right at sunrise. The building changes color as the sun rises above it and the jewels (individually placed by hand in the sandstone blocks) that decorate it’s exterior sparkle as they become covered in sunlight. You don’t want to miss this! To ensure you’re in the complex by sunrise, plan to arrive at the East Gate by 5:30AM. The ticket counter opens at 6:00 am, but a line will start to form before that. (I know this is early, but I'm not exaggerating). You can’t drive directly up to the ticket counter that early, so you’ll have to walk about a half mile to reach it. There are two ticket lines, one for foreigners and one for locals. The foreigners ticket costs 1000 rupees and comes with a water bottle as well as shoe coverings. Don't lose these as you'll need them when you get close up to the Taj Mahal. Get to the Taj Mahal early to avoid the crowds. 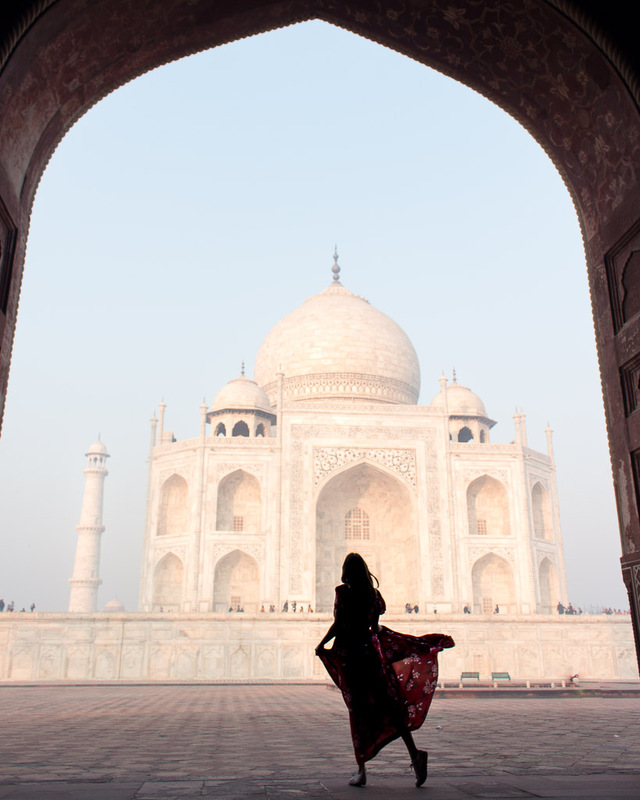 Bring as little as possible with you into the Taj Mahal. I brought my tripod all the way to India with the hope of getting the perfect shot. Luckily, I found out before leaving my Airbnb that I couldn’t bring it into the Taj Mahal complex. Besides the water bottle that comes with your ticket, you cannot bring any other food or drinks nor anything plastic. My boyfriend bought me a flower necklace at a street market that matched my dress and even that got taken away at the gate! I also recommend leaving any type of purse or bag at home. There is a separate line you’ll have to get in if you need a bag checked, so save yourself some time and don’t bring a bag. I wore my camera around my neck and had my money belt hidden on me. You won’t need anything else. 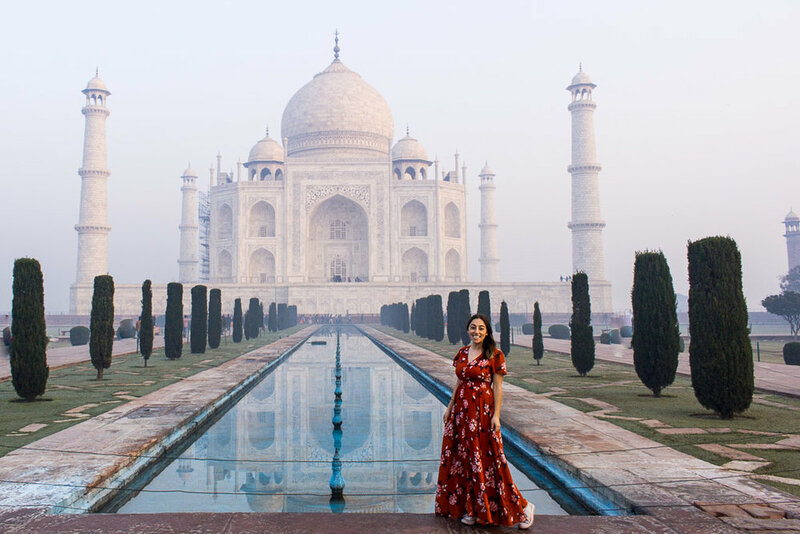 After taking pictures by the reflection pool, head to the wall at the right of the Taj Mahal for the view of the sunrise. The Taj Mahal is located in Agra, a three hour drive from New Delhi. While it is possible to take a day trip, I recommend staying in Agra the night before. I stayed in an Airbnb and shared a wishlist in the where to stay section below. I had a driver during my time in the Golden Triangle (Delhi, Agra, Jaipur) but you can also take a train or bus from Delhi to Agra. Having a driver was convenient because I knew I had a ride from my Airbnb at 5AM to get to the Taj Mahal. I was the first foreigner in line at 5:30AM at the East Gate. The ticket counter doesn’t actually open until about 6:00AM, but there was a line behind me by that time so I still recommend getting there early. Once you buy your ticket, there is another line to enter the actual Taj Mahal complex. This line has 4 sections - local women, foreign women, foreign men and local men. When I got into this line, I was about the 30th foreign woman. I asked the women in front of me how she was able to get her ticket because you can’t buy them in advance (no matter what anybody tells you, tickets cannot be bought the day before nor reused) and she said she had a local tour guide wait in the ticket line for her. This costs extra and can be done with guides that are arranged ahead of time, but should be avoided with "local" guides waiting outside the entrance claiming to get foreigners a VIP ticket. Considering she was just ahead of me, it didn’t seem to make much of a difference that early, but may be a good idea if you visit later in the day when the crowds get out of control. Standing under the gorgeous arches at the wall to the right of the Taj Mahal. If you decide to go with a guide, insist on getting your pictures first and then start the walking tour. As soon as I got it in, there were about 30-50 people with tour guides stopped at the entrance so luckily for me, I passed them and headed straight to the reflection pool in front of the Taj Mahal. There was hardly anyone there, and I thankfully had time to take the pictures I wanted before everyone else arrived. 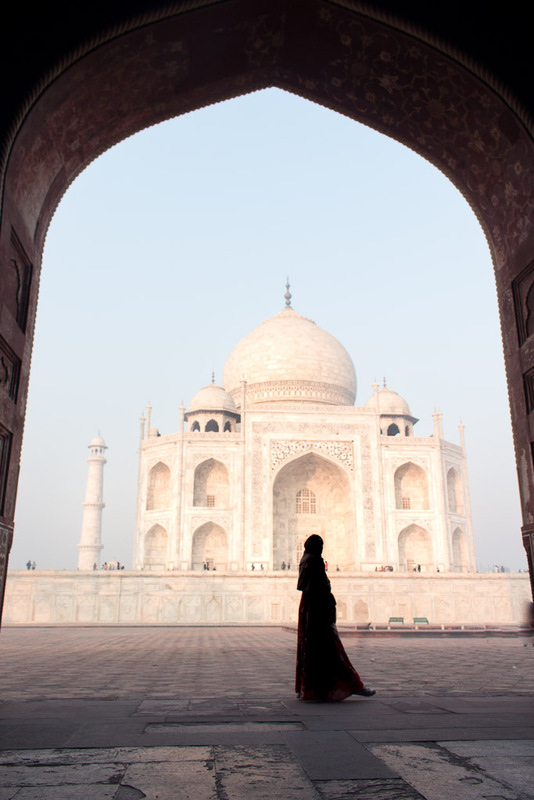 When you walk in, you'll go through a gate and see the Taj Mahal for the first time. Turn right down the stairs, walk past the platform and stand in front of the rope to get the perfect reflection picture. If you want to have a picture taken with you in it, I recommend having your appointed photographer stand in front of the platform at the same level as you as opposed to taking a shot from the platform above. The sun was just coming up when we were at the reflection pool and the Taj Mahal had an amber glow to it. After taking a few pictures in the front, I suggest walking further to the right of the Taj on the side where the sun rises. 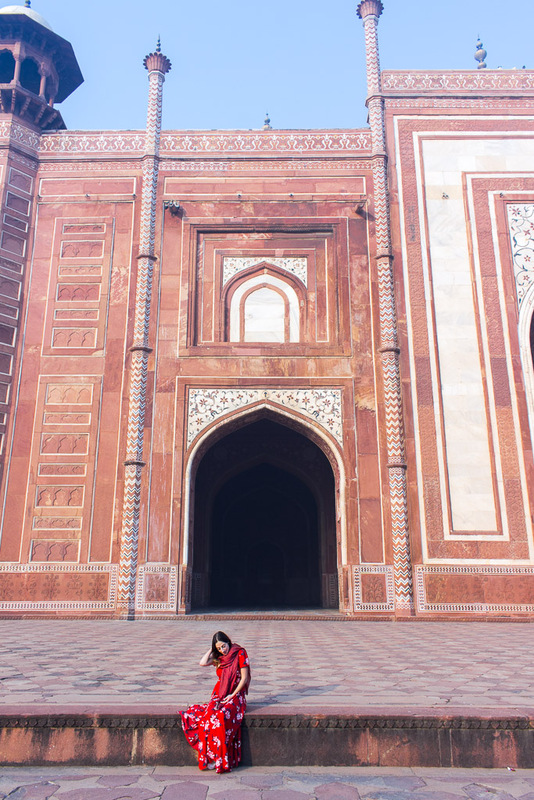 There are two red sandstone walls lined with gorgeous arches on each side of the Taj Mahal. These arches work as beautiful framing for the Taj Mahal from this angle. 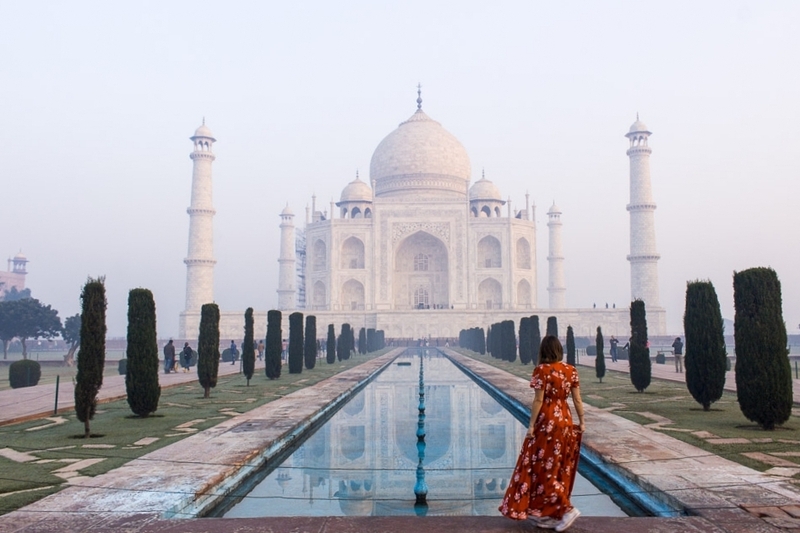 I also recommend wearing a bright color to the Taj Mahal if you plan to be in your pictures. I wore this red dress and the color really popped with the white background. If you want to learn more about getting the perfect picture, check out our guest post on improving your travel photography. We spent about 20 minutes on the right side of the Taj Mahal and saw the color of the building change as the sun rose higher and higher. You can even see the jewels that decorate the building sparkle in the light. It was an incredible experience. From there, we walked around the back of the Taj Mahal and looked over the river, explored the left side and eventually joined the line to go inside. The inside of the Taj Mahal left a bit to be desired. The carvings and detailed masonry are beautiful but just didn't compare to the grandeur of the building when viewed from the outside, plus you have to walk through this extremely crowded section single file so it can take a while. In total, we spent about an hour and a half at the Taj Mahal and by the time we left, the line was a mass of people as far as you could see. You can exit through whichever gate you entered and by that time the stores and merchants lining the streets will be bustling with activity. We walked back to meet our driver and headed off to Jaipur. The buildings on the side of the Taj Mahal have similarities to Humayun's tomb in Delhi. I loved the Taj Mahal, but wasn't as impressed with the rest of Agra. It is less developed than the other cities we visited and the monuments outside of the Taj are somewhat underwhelming. I learned this after doing some initial research and it is why we only stayed one night. It was the perfect way to get the sunrise photo I was dreaming of and I recommend planning your trip this way. The Airbnb we stayed in was a lovely homestay and with a beautiful rooftop deck. The family we stayed with was very friendly and accommodating. They made us dinner and gave us bananas and crackers for our early morning ride since we left a bit earlier for breakfast. I've also put together an Airbnb wishlist to help you decide where to stay yourself. If you're not already a member of Airbnb, feel free to sign up here. >The best city to travel to Agra from is Delhi. The Golden Triangle is a great starting point for first-time visitors to India. This includes Delhi, Agra and Jaipur, the pink city. If you're interested, take a look at our Two Day Delhi Itinerary for tips on what to do while you're there. >While it is not necessary to plan out specific day-to-day activities for your trip to India in advance, I do recommend having your main transportation and accommodations booked before you arrive. This means, book your flights and trains, and ensure you have a hotel or Airbnb to stay at. >Depending on your country of origin, you may need a visa to travel to India. You can apply for an e-visa online. The cost also varies depending on your nationality. >It’s also important to contact your doctor to find out if you need any shots or medications for your trip. For example, I was given a Typhoid vaccine as well as malaria pills for my trip to India. I also asked for a prescription for Azithromycin, which quickly treats traveler’s diarrhea. It’s better to be safe than sorry! >India has a gesture that is very unique to India. It’s a head shake or “wiggle” as I like to call it. It doesn’t mean yes, it doesn’t mean no, and it’s a bit hard to define EXACTLY what it means. What I can say is that it’s a kind gesture and after a while, you may start doing it yourself! You’ll see a lot of service professionals wiggle when they are helping you or after you thank them. >For this trip, we flew into New Delhi, drove to Agra and Jaipur, and flew domestically to Jodhpur, Goa and Kerala. Trains are a common method of travel in India, but we had so much trouble trying to book them in advance that we opted for a driver and flights. Our final departure was out of Cochin International Airport. >To get from Delhi to Agra and then to Jaipur, we booked a driver in advance. His name was Raju, and he picked us up daily and drove us through Delhi, Agra and Jaipur. The total cost of this was just about $250 USD. We were lucky enough to have a contact in India through a coworker but this post from Tripsavvy will help you book a driver during your two days in Delhi, and beyond. This was especially convenient because we had a driver to take us to the Taj Mahal at 5AM. >You'll need a converter for the plugs in India. I recommend this India power adapter , which comes with three inserts. It worked at every Airbnb we stayed in. >Be aware of your surroundings. I felt very safe in Delhi, but it is a very crowded city so you want to travel smart. When you're out exploring, especially in crowded tourist areas, I recommend wearing a travel money belt to hold your passport and money. >If someone on the street comes up to you and asks you to purchase something that you aren't interested in, just say no. They may follow you and be persistent, but continuing to say no in a stern tone always works eventually. You never want to say “maybe later” because the seller may decide to follow you until later happens. I’ve had this happen to me. >While there is no dress code for the Taj Mahal, I recommend dressing conservatively. If you want to be a part of your photos, I recommend wearing bright colors that pop in front of the marble backdrop. >Bring a jacket or warm scarf with you the morning you go to the Taj Mahal. It was cold before the sun came up. >Don’t drink the water in India. It has bacteria in it that most foreigner’s bodies aren’t used to. This also means avoiding ice and any raw fruits or vegetables that may have been washed or exposed to the local water. One product that may be useful is the Lifestraw . You can use it if you find yourself without access to bottled water. >Indian food is delicious, but it’s also spicy and really your only option in most of India. I recommend bringing some granola or protein bars to eat when you need a break. I brought an entire box of RXBARs with me and they definitely came in handy. Don't bring these into the Taj Mahal Complex though! >As I mentioned above, I recommend exploring the Taj Mahal without a guide. If you do decide to go with one, make sure you still enter the East Gate. Our driver tried to convince us to enter from the South Gate and the Taj Mahal government website also recommends that all tourists enter the South Gate. I had researched in advance and read that the East Gate was the fastest way to get inside, so I insisted that we enter that way. I can't compare it to the South Gate since I didn't end up there, but the East Gate worked out well for me. Do your research and trust yourself. Thank you to Tep Wireless for lending me a pocket wifi device so I could stay connected while in India! Plan the perfect trip to this picturesque hill station town in Northern Vietnam. Spend two days exploring ancient temples in Cambodia.